Favorite Quote: She fell silent and doctored the cut with the same brisk, confident motions she’d used for cooking. I hear that they make disinfectants that don’t hurt these days. Harry gets an unusual client in this book, the Vatican. 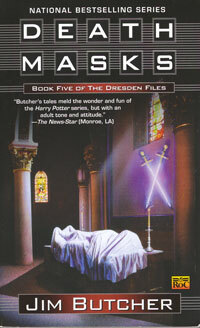 A priest hires Harry to look for the missing Shroud of Turin. Because that would be too simple a problem for Harry, his ex-girlfriend Susan returns to settle her affairs in Chicago. That is still not enough for Harry, he also agrees to a duel with a Red Court vampire in hopes of ending the war currently raging with them. This book introduces us to the second set of major antagnoists Harry Dresden will be taking on, the Fallen, or the Order of the Blackened Denarius. This group is composed of 30 of the fallen angels who followed Lucifer during his revolt against heaven. Each member is tied to one of 30 pieces of silver, the silver Judas tossed aside after betraying Jesus. When a human touches the silver he or she becomes open to the angel’s corruption. The two will form either a partnership or the angel will take over all together. Either way the person gains access to vast amounts of knowledge and power. Harry makes a choice in this book that places his very soul at risk. Harry being Harry, this was the only choice he could make. This simple choice will dominate Harry’s growth as a character over the next few books. It will threaten his relationships with the people he loves. Essentially one small paragraph and it is the most important thing that happens in the book. This book settles the issue of Susan and Harry and gives Harry the option of moving on with his life. The book sets up a major plot issue for many of the next books. It is an important book from the series standpoint. It is a good book in its own right too. There are a few large-scale battles and of course many small ones. This book was a little darker than the others. All Dresden Files books contain some sad or dark elements, but this one combined both sadness and darkness with good effect.